Tezpur University organized an event on the death anniversary of Kalaguru Bishnu prasad Rabha (celebrated as Rabha Divas in Assam)who contributed immensely to the literary, cultural and political landscape of Assam. The event was held at the Council Hall of the University. The day started with a floral tribute at the bust of Kalaguru, placed in front of Kalaguru Bishnu Prasad Rabha Auditorium. Vice Chancellor Prof. VK Jain, was accompanied by several other members of TU fraternity in paying respect to the Cultural Icon of Assam. On the occasion, Prof. Jain talked highly about the contributions of Kalaguru towards the betterment of humankind and termed him as a “social, economic and political scientist and at the bottom of his heart he had a burning desire that every Indian lives a life of dignity, where there is no discrimination, truly a great son of India”. It was followed by a cultural programme in the evening. The programme started with a rendition of Rabha Sangeet by the members of Pragati Women’s Association. A short video exhibiting some rare photographs of Bishnu Rabha (prepared by Parikshit Sarma, Research Scholar Dept. of Cultural Studies) was shown to the audience. Prof. DC Baruah, Senior faculty from the Dept. of Energy delivered the welcome address and emphasized on inheriting the ideals directed by Bishnu Prasad Rabha. Prof. DK Saikia, Pro Vice Chancellor, Tezpur University delivered the inaugural address and talked about the important role of Bishnu Prasad Rabha in shaping the greater Assamese Community. 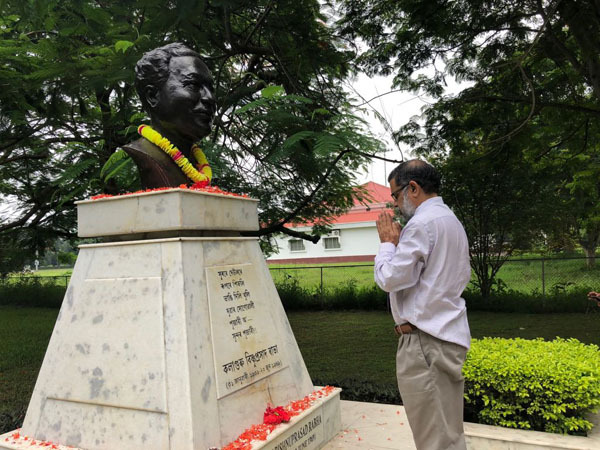 “Bishnu Prasad Rabha was a multifaceted personality with an indomitable spirit, who left a permanent mark in the history of Assam through his revolutionary ideas and thinking” Prof Saikia observed. It was followed by speech and performances of Guests of Rajib Prakash Baruah, Director, Directorate of Information and Public Information and renowned singer Dr Sangeeta Baruah. Dr Sangeeta Baruah gave enthralling performances of Rabha Sangeet.